Americans love junk food, and we continue to fool ourselves into thinking that there is a magical solution that will allow us to eat as much as we want without gaining any weight. 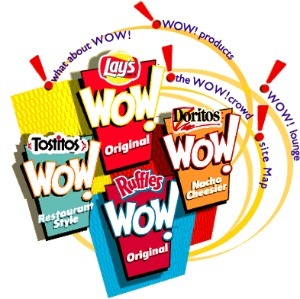 In 1998, Frito-Lay introduced WOW Chips, fat-free chips made with olestra–whose molecules acted like a laxative when people ate too much. Here’s how Frito-Lay played chicken with a branding disaster. Americans love junk food, and we continue to fool ourselves into thinking that there is a magical solution that will allow us to eat as much as we want without gaining any of the weight. Yes, discipline and control are truly hard pills to swallow, so show us great-tasting fat-free food that doesn’t go to our hips, please. That’s exactly what happened in 1998 when Frito-Lay introduced Lay’s, Doritos, and Ruffles WOW Chips, fat-free chips made with olestra. At first glance, olestra seemed like a dieter’s dream. While it provided the satisfaction of tasting just like fat, its molecules were too large to be digested by the body, passing directly through the digestive tract unabsorbed. Sadly, the result was similar to that of a laxative–stomach cramps and diarrhea prevailed. Sales, er, “exploded” at $347 million, making it the best-selling new product in the U.S. that year. But given the media storm around the unpleasant side effects, sales dropped to $200 million by 2000. WOW Chips were quietly renamed “Light” products in 2004–possibly reformulated (no confirmation found regarding this), but still listing olestra on the ingredient statement. 1. Dietary Evaluation–When you stacked up the numbers, you couldn’t help but find them attractive. An ounce of regular chips contain 10 grams of fat and 150 calories. An ounce of WOW Chips has 0 fat and only 75 calories. Amazing yes, but where’s the catch? If someone would have stopped and thought “It’s too good to be true,” then maybe they would have discovered the toll olestra takes on the body when eating more than an ounce of the stuff. 2. Taste Test–No doubt that taste tests took place comparing the WOW Chips to their fatty counterparts, but exactly how many chips were eaten in this side-by-side comparison? My bet is that no one thought to do a true product test, eating the entire bag in one sitting. When it comes to junk food, anyone in their right mind knows that no one follows the serving size suggestions on the back of the package. 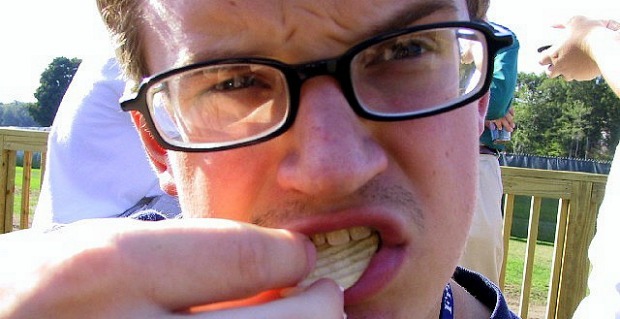 Lay’s even ran a campaign around this fact–“Nobody can eat just one.” Any junk-food connoisseur knows that the worst-case scenario should always be evaluated when a new ingredient is being considered, and that means eating an entire package in one sitting. 3. Warning Label–The FDA required a warning label on the front of the package. If the FDA has concerns, why would you want to take a risk with public safety on a food item bearing the names of your beloved flagship brands? My advice is to run away from a red flag like this one f-a-s-t. So what can we learn from WOW Chips? 1) Common Sense–You know the old adage “If it sounds too good to be true, it probably is.” When innovating, it’s easy to get caught up in the numbers and the profits, but often we forget to run our idea through a common-sense filter. If nothing else, take a closer look at the FDA’s evaluation to understand why they determined it needed a warning label. Warning signs are there for a reason. 2) Health Concerns–It’s only human nature to want a “magic pill” so we can eat whatever we want without dietary consequences, but a diet full of olestra isn’t the answer either. Give me snack foods that encourage positive behaviors around balance and moderation please (like 100-calorie packs), not negative behaviors that encourage over-indulging. 3) Consumer Trust–Never put your flagship brands in danger with a questionable ingredient. Frito-Lay risked losing consumer trust by using olestra. Fortunately, no long-term damage was done–just some funny stories told in hindsight about how the initial success of WOW Chips led to a proportional increase in toilet-paper sales. Sandstorm Inc. is an innovation firm specializing in the upfront insights and innovation process. Sandie Glass and Laura Wolfram bring a combined 34 years of experience in helping Fortune 500 companies like Procter & Gamble, Disney, Nike, American Express, GlaxoSmithKline, and M&M/Mars tap into their creativity to achieve remarkable business solutions for market success. Their strategic focus and extraordinary talents take the “blinders off” to unleash the opportunities necessary to connect with consumers who buy.